N10 Fortis Green Tree Surgery & Gardeners | RDA Cleaning & Maintenance Ltd. If you have a great patio in your property, you are lucky. A garden can make the leisure time at home more pleasant and even healthy - outside at the fresh air it is so beneficial to relax! But to take those benefits of your garden, proper care is necessary. Remodel your garden area without even a single effort! Make it the outdoor paradise of your home simply and on a budget. We can offer you a great bunch of modern and competitive gardening services in Fortis Green N10 on a budget! Our professional gardening company is a smart solution for the perfect and effortless exterior space. A team of two gardeners in Fortis Green N10 arrive at your location. Once there they will inspect the actual condition of your garden. After this, they will listen to what precisely the customer requires them to do. Then our professionals will discuss every detail of the service with the customer. They will suggest the proper means to deal with the problems in his garden, how much hours it is going to take and at what price it is going to be. If they both agree on the terms then it is possible for our gardeners to start right away. Why Book Garden Renovation And Maintenance From RDA Cleaning & Maintenance Ltd. 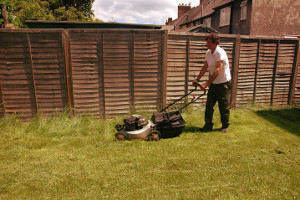 Suitable for landlords, tenants, home owners, residential building owners and property managers, our professional gardening renovation & maintenance services in Fortis Green N10 comes with a special love to the lawn. Our top rated gardening company follows the motto of individual approach + special attention to the details as the best formula for success. The talented gardeners are instructed to perform proper lawn mowing and lawn care: reseeding patches, fertilizing, watering, edging. We have special discounts for regular customers. And if you book gardening service with any of our top-notched services, you will receive a special discount, too. Do not doubt, but rely on our top rated and hassle-free gardening maintenance service in Fortis Green N10! Get a free quote right away! We offer reasonable and affordable prices. To make an instant order, please, use the online booking form on our website. Note that free surveys are available on site. Dial this phone number 020 3404 1646 and contact us right away! We will be truly glad to assist you in turning your outdoor space into a welcoming and lovely area. The nearest tube station serving N10 Fortis Green is East Finchley.